I am so excited for today's blog post! I was recently given the chance to try out a new line of at-home gel nail polish called DIY Hard Nails (pronounced "die-hard nails" for all of the die-hard nail lovers out there). I'm always on the lookout for what's new and hot in nails, and I was especially excited to try a new brand, so I jumped at the chance to try it and do a review. The gel colors I saw were really beautiful and were full of chunky glitter- so fun. Oh, and guess what? They change colors depending on the temperature! Intrigued? So was I.
DIY Hard Nails are just like any other at home gel polishes and they require an LED or UV lamp, along with a gel base and top coat. Now, which type/brand of lamp is up to you, just know that they take 45 seconds to cure under an LED and anywhere from 2-3 minutes per coat under a UV lamp. I used the DIY Hard Nails base and top coat, but you can use your own if you have a different brand (Gelish, CND, Sally Hansen, Red Carpet Nails, etc). DIY Hard Nails are salon quality and are 5-free, meaning no harmful chemicals. Pink Frost from cold to hot. Pink Galaxy from cold to hot. Coca Cola Float from cold to hot. 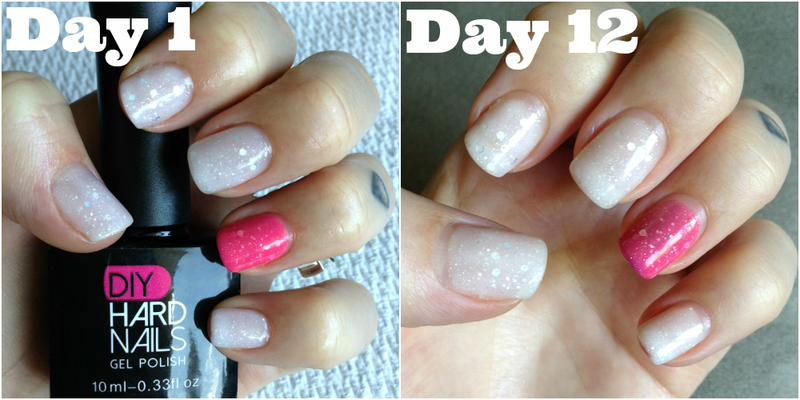 I decided to try out Pink Frost and Pink Galaxy for my first DIY Hard Nails manicure. The consistency of the gel was exactly like all of the others I've used, so it was really easy to apply. The only issue I had was with the Pink Frost- the bottle comes as a bright, hot fuchsia pink color, but as soon as it hit my nail it turned the white glittery color, which made it a bit hard to see when applying around the cuticle area. I kind of wish the color-changing effect was reverse for that color- white while cold and dark pink for hot. But I still love it. My nails started off pretty short, so they were mostly the warm colors at first, but as they grew out they would change more and have more of that ombre effect. I'm really, really impressed with how well these gels have held up! I'm going on 13 days with not a single chip, break, or peeled up corner. My nails feel very strong and protected and even with the extra length on them after almost 2 weeks worth of growing I haven't broken a single nail. Impressive! Overall, I'm really happy with DIY Hard Nails and I'm excited to try out everything else they have. You can go here to purchase their products. All customers recieve a free bonus Ebook "Nail Salon Secrets to the Perfect At-Home Gel Manicure" with every order. You can try everything for 30 days risk free, 100% money back guarantee if you're not happy with it (but you will be). Order any 3 and they ship free! 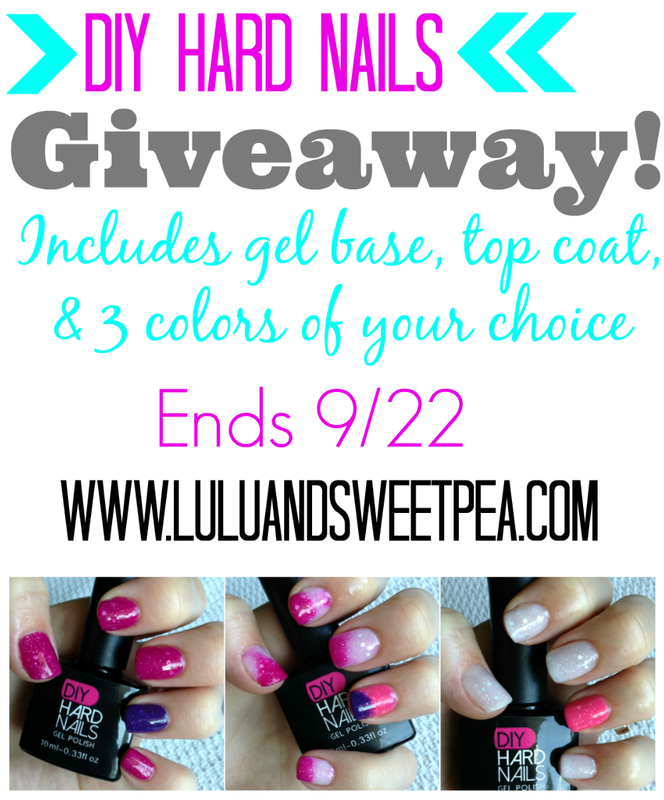 Who wants to win some DIY Hard Nails gel polish? What color are you most excited to try?